There are at least 3 ways to find out if the column in table exists in MS SQL server. It's a common task for developers or administrators when you need to modify table. 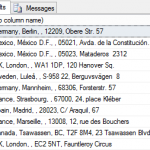 There's a column Photo with type "Image" in MS SQL table (database – MS SQL Server 2008 R2). The task is to get all the records where Photo is empty. Values of empty images is "0x00000000". To receive quantity of rows of the returned records of SQL query, you should use function @@ROWCOUNT. Function @@ROWCOUNT returns the quantity of rows, which were used in a query. How to get as SQL query result the list of databases in SQL server. 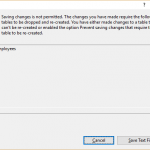 When you modify columns of a table in MS SQL management studio, you got the message "Saving changes is not permitted. The changes you have made require the following table to be dropped and re-created … " (Figure 1). The reason of this is re-creating of table. It's really important for productive environment but not very for test ones. It’s a little tutorial about how to get all duplicate records on namesakes example from your database table. For example, we have a table with columns Id, FullName, Birthdate and Phone. Concatenating of string columns is not very simple task in T-SQL if you don’t know ANSI standart of it. According to ANSI standart of SQL, concatenating of NULL-value is NULL in the result. It’s not clearly for developer, but it is so. In this post I will write about SQL conditions. It seems to me that construction "IF ... ELSE" you can find in any language. Transact SQL is not exclusion. I don’t often use SQL queries but sometimes I have to. And every time it’s the same – I use search engines to find documentation, especially about work with datetime fields. During these readings I found out at least 3 ways to select records with date I need.